Prices Stayed Flat In December-Deflation For January? 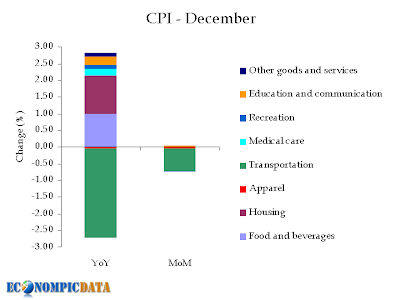 As if you needed any further evidence that deflation is not that far away, the CPI for December provided it. Consumer prices fell by 0.7% and the core rate was basically flat. The numbers are seasonally adjusted. Another number that was released was industrial production. It was down 2% for December versus November. That was double the expected decline. Some analysts think that January could bring the first headline deflation numbers. Expect the Fed to pay attention. This is what truly strikes fear in a central bankers heart.